Albert Whitman & Company, 9780807577318, 32pp. 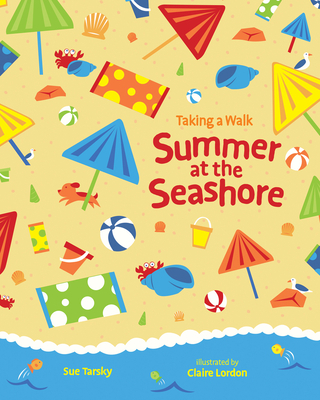 Join the fun of finding and counting all the animals, flowers, and insects, as more and more appear on a thrilling walk along the seashore during the summertime. Packed with repetition that young children love and that also helps them learn, this is an entertaining introduction to colors, numbers, and the seasons. Born in New York City, Sue Tarsky lived and worked as a children's book publisher for many years in London. She is the author of several books for children including the Busy Building Book and Kiss the Boo Boo. Claire Lordon is an illustrator and designer of children's books, surface designs, maps and murals in Vancouver, Canada. She earned her BFA in illustration at the Rhode Island School of Design. Her work is inspired by her spirit of adventure, love of the outdoors, and an enthusiasm for travel.